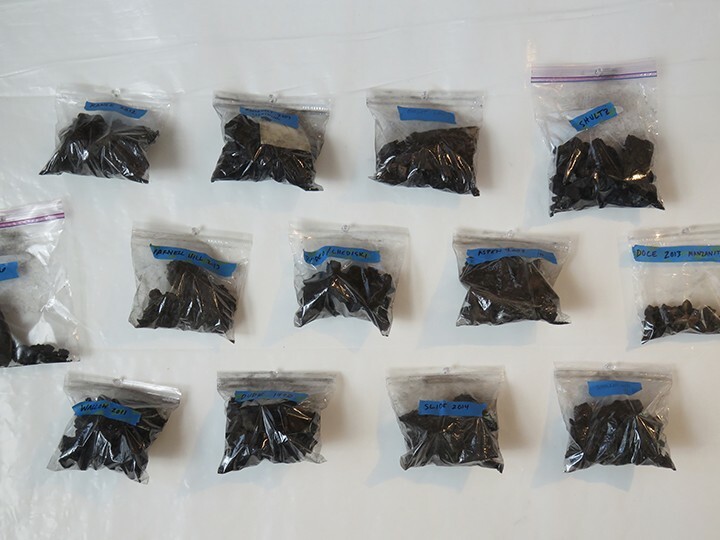 Charcoal collected from thirteen significant wildfire sites in Arizona, for the Fires of Change project. From top left: Range (2012), Roosevelt (2007), Outlet (2000), Shultz (2010), Warm (2006), Yarnell Hill (2013), Rodeo/Chediski (2002), Aspen (Walhalla: 2009), Doce (2013), Wallow (2011), Dude (1990), Slide (2014), Woolsey (2011). One more site to collect during spring break: Aspen (Mount Lemmon: 2003).